Do you need to find a respected name in Landmark Virginia lawn service? Look no further than the team at Complete Lawn Service. Complete Lawn handles all your outdoor needs, from lawn care to landscapes to sprinkler systems and more. We’ll create and maintain a lawn and landscape that magnifies your home’s visual appeal…and increases your home’s resale value. Lawn And Bed Care. Our lawn care takes the hassle away. We offer bi-weekly mowing and edging services from March to November, and we’ll bag and recycle the clippings. We provide lawn care programs that seed and feed for strong soil and eliminate insects and weeds for a lush, green lawn. And we keep your shrubs and plants growing and trimmed for an amazing outdoor look. Landscapes and Hardscapes. We’ll come up with an eye-catching and sustainable landscape that balances plants and bushes for form and function. Our hardscapes can be designed for either a formal or natural look, with patios and walkways that are ideally placed. We can also ensure your space drains properly, eliminating damaging flooding and erosion. Irrigation. We employ a Certified Irrigation Designer who will examine your property and determine ideal watering levels for each zone, and design a sprinkler system with proper components that distributes water efficiently without waste. We provide year-round maintenance, including examining connections and deactivating for the winter months, and we can repair or upgrade your system too. Complete Lawn can also spray your property with natural oils that safely eliminate mosquitoes and ticks. And we don’t stop in the winter months! If you need to contract snow and ice removal, we’re prepared with plows and ice melting equipment to get you going again. If you’re a new customer, we’ll even slash 50% off of your first lawn mowing or lawn maintenance service. 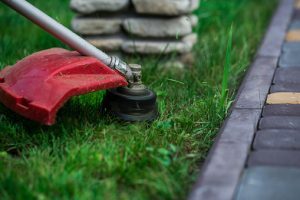 Contact us now for a complimentary consultation and find out why our experience and professionalism make us the trusted name in Landmark Virginia lawn service. We’re ready to change your outdoor space for the better!